The favourite commodity amongst investors is burning their fingers a little more each time it declines. Gold is now firmly below $1800 at $1775 it is looking rather bearish at the moment with the short term trend downwards, capped by a falling trend line. Support and resistance for the metal is seen at $1745/25 and $1840/86 respectively. Gold continued to head sideways and over the past few days it really has been out of the headlines. At $1810 this morning, the bulls remain nervous over the double top which looms large and an upper downward trend line resistance has formed, putting more pressure on the bulls. Near term support and resistance for the metal is seen at $1795/70 and $1830/50/86 respectively. One gets the feeling that the recent calm in this market might lead to a big move in either direction sometime soon. The silver spread betting market also saw a little weakness yesterday and has found it hard to break beyond the $44/45 mark with all the concerns over global growth recently. This morning it is at $40.50 with near term support and resistance seen at $40.00/39.75/39.00 and $40.80/41.40/42.10 respectively. The gold spread betting market has been hovering around $1830, flirting with the $1800 level, and whilst the euro situation unfolds traders are unsure about how to position themselves in the metal. We're at $1828 at the time of writing and the focus remains on what might come of today's Merkozy meeting and what might be the possible outcome of Friday's G7 meeting. Until then we might well trade sideways for now, with the ominous 'double top' still looming in traders' minds. Banks on the French stock market were one of the reasons for the drop in gold's price yesterday. They're rumoured to have a large exposure to Greece, which is on the brink of bankruptcy. As a result, investors were yesterday preparing for chaos and removing their money from assets and into their mattresses after taking more seriously the saying 'cash is king'. The precious metal lost $43 to end the session at $1813.6, the support provided around the $1800 level. At time of writing, potential hedgers are seeing a small bounce, as the precious metal is trading at $1823. Crude oil prices tailed the euro yesterday as headlines were filled with European debt woes. The rumours of a downgrade on French banks by Moody's sent the single currency head over heels and fears of reduced oil demand were spurring on the sell-off in the energy markets. Nevertheless, as the euro rebounded, so did crude, possibly as investors closed their short positions amid profit taking. Brent crude is currently trading at $112.72. Friday morning's session saw many commodities spread betting markets lose a lot of ground as the dollar strengthened and therefore they were more expensive in dollar terms. Whilst gold fell, it struggled to stay down as concerns over Greece defaulting on its debt obligation flared. Equity markets felt the brunt of this, with investors pulling their money out of riskier assets and throwing their cash into safe havens. The yellow brick ultimately ended the day down $13.7 at $1855.5. At time of writing though, despite the falling equity markets, gold still seems to be out of favour, as it's trading down further at $1835.0. The crude oil spread betting market's inverse correlation with the US dollar was apparent on Friday. This came as traders put their money in the rediscovered currency safety haven, seeing as the Swiss Franc has now been capped and no longer has that hedging appeal. So as the dollar rallied, Brent crude oil slipped off and ended the day just over 150 points lower at $112.58. 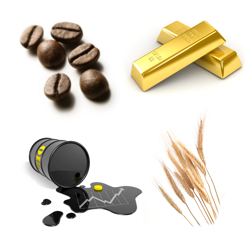 The losses are being extended at time of writing though, with the commodity trading down further at $110.91. Gold attempted to gain more of the lost ground from Wednesday, rallying back above $1850, and is continuing in that fashion this morning with the metal at $1876. The double top formed on the daily spread trading chart looks dangerously like not materialising as the metal is racing higher again and not far off testing its all time highs once again. It would seem that any sort of correction at the moment simply provides the bulls with yet another buying opportunity. The shares spread betting markets' rally yesterday didn't do much good for gold. The metal plummeted some 3%, hitting a low of $1800 and actually closing below its 9 and 14 day moving averages. At time of writing though, after the excitement has started to quell, it looks as though the hasty traders have actually realised that the uncertainty in the global economy is unlikely to disappear and gold is back up at $1840. Crude oil mirrored the equity markets again and was supported by a slumping dollar. This strength came even with the hovering concerns on the health of the US economy as many analysts started to readjust their growth forecasts to the downside. Today sees the US department of Energy release their inventories, a day late due to the Labor day earlier this week, and combined with Obama's speech, traders could be in for a sizeable market reaction. FX spread betting markets were all about the Swiss Franc yesterday which saw significant weakness after the Swiss National Bank decided to cap the strength in the Franc at SFr 1.2000 to the euro. This caused gold to plummet yesterday as investors chose to release funds and hop on the Swiss move. This could mean that risk-averse participants will have one less haven to find safety in. They showed their dismay at this by pushing the precious metal down $28 to $1873.5, after stretching to a new all time high of $1920.9 earlier in the session. It doesn't look like investors have calmed yet either, as at time of writing, the hedging favourite is down a further $21 to $1846.9. Much like gold, crude oil was pushed down by a strengthening dollar as the two have an inverse correlation. After having enough of a beating though, the energy market decided to start drawing its power from the equity markets, which were surging ahead after bouncing off their daily lows. This helped the black gold break into positive territory for the day despite the ongoing fears about the health of the economy. This morning Brent crude oil is up to $113.60. Investors yesterday wanted to find a protective cover to hide under as fears of a second recession splattered the markets. This cover appeared in the form of the metal and traders grouped under the hedging favourite as equity markets dumped and safety havens rallied. At the end of the session, the precious metal had gained $16.2 to $1899.6, opening up the way for an attempt at breaking the August 22 high. This was no problem this morning, as market participants witnessed the gold market touch a new all time high at $1921. For crude oil, the Labor Day holiday in the US meant extremely thin trading volumes. The black gold extended losses on the back of concerns over the global economy slipping back into a black hole and therefore denting the demand for the commodity. Other factors to consider were weakening support for German Chancellor Angela Merkel, which spurs doubt about the euros survival, and also the lessening of tropical storm Lee, which had been supporting crude prices of late. Disappointing US employment data helped spur investors back into the gold market on Friday as they were reminded that the largest economy in the world is still in trouble. This came after a round of weak manufacturing data, boosting the need for a currency alternative and therefore sending risk-averse traders into the metal. The fall in the equity markets though this morning hasn't sparked a further rally, as gold is hovering around the $1885 level at time of writing. Gold's cheaper alternative silver also enjoyed the company of risk-averse investors as speculation was rife over the Fed having to ease its monetary policy again at some point. All of Friday's concerning economic data helped silver gain nearly $2 to finish the session at $43.20 and, with a bullish short term trend, we could see the August 22 high of $44.22 challenged. Concerns were flowing about demand for oil as the employment figures came in unchanged, below the expected figure of 80,000 jobs being created. Even with the Tropical Storm Lee potentially hitting the Gulf of Mexico's refineries, normally offering a good support for the commodity, crude oil prices weren't held. Instead, market participants jumped onto the fears that oil wasn't immune to the faltering US economy.